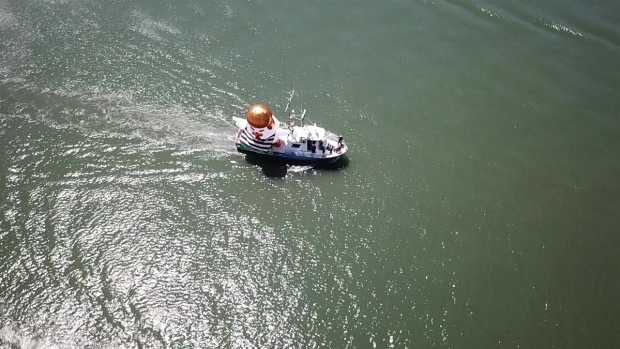 The Trump Chicken made a return to San Francisco, sailing aboard a boat in front of the Bay's most iconic landmarks. Chickens aren't exactly known as waterfowl, but one especially large chicken that first appeared at a protest in April, 2017 came back to the Bay over the weekend — this time, aboard a boat. The Trump Chicken — a giant, inflatable effigy that resembles a cross between the barnyard bird and President Donald Trump — has popped up at demonstrations around the country since its debut last year at the San Francisco Tax March. This time, it set sail for a three-hour tour around Fishermen's Wharf, The Embarcadero and McCovey Cove aboard a vessel marked "Alcatraz Prison Transport" — with its golden-haired passenger clad in a striped prison shirt marked with an inmate number: "00045." Trump Chicken was seen floating about in San Francisco Bay again on July 22, 2018.